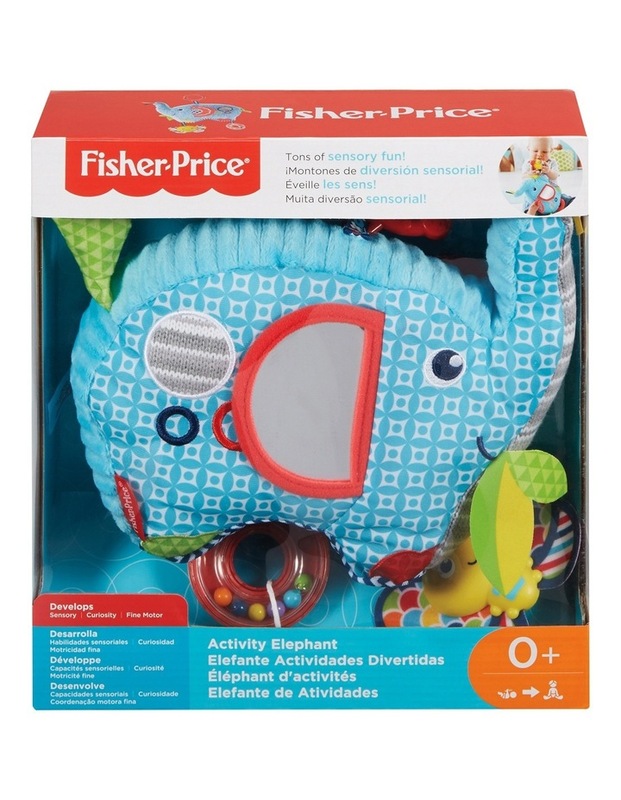 A memorable friend and first companion for your newborn, this large, soft elephant is loaded with fun-to-touch textures like crinkle, corduroy, knit and plush. He's full of surprises, including a mirror in his ear and fun jingle sounds when baby shakes or bats him. There's even a rattle and colorful butterfly dangling underfoot. And when you and baby are on the go, just clip him to your diaper bag or stroller for more unforgettable fun! Where development comes into playTM Sensory Variety of tactile elements, baby's own reflection, and bright colors & patterns help engage your little one's senses. Fine Motor Grasping and exploring the activity toys help strengthen baby's fine motor skills. Security & Happiness The soft, friendly elephant character keeps baby company.